Our Novices competed in their first race! With out N8+ taking third place and bringing home some bronze hardware. Our JV8+ also took home third, making it a successful regatta for UCD! 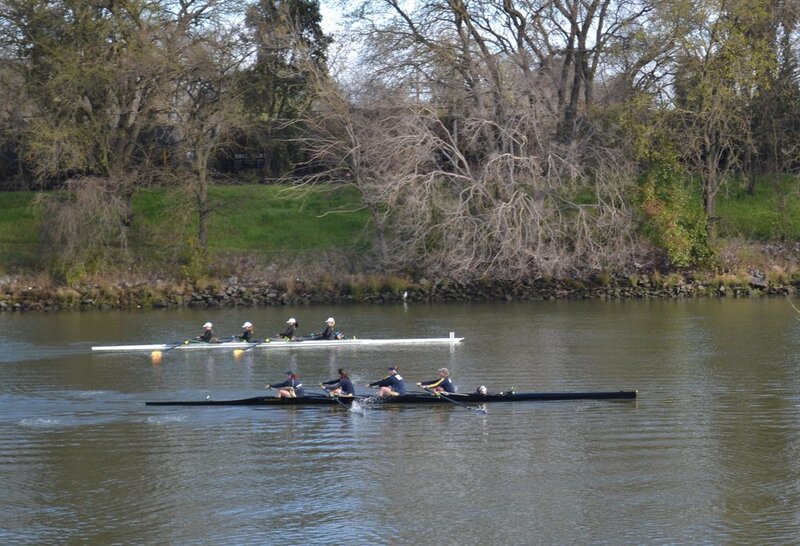 UCD W Rowing had some awesome racing today (April 14th) against Sonoma State and Cal Lightweights. Not only did the team row its typical 8's and 4's, we also rowed a pair, and even a 2x (yay, sculling!). It was a fun race day, and also served as great practice for WIRA, which as of now is only 2 weeks away! Our 2 Varsity 8+ boats came in 3rd and 4th, ahead of both Mills and Saint Mary's C boat, at 18:57 and 19:31. Huge thanks to Michael Long for taking such incredible photos! The Novice 8+ took first place in their Saturday heat, finishing 13 seconds ahead of second place crew, Humbolt State. They then attacked the Grand Final on Sunday, finishing with a boat length of open water on second place crew Orange Coast College. The Varsity 8+ took first in petite finals after suffering a broken rigger during their heat cost them their ticket to the Grand Final. The team also entered a Varsity 4+ for the first time and we had an Alumni boat entered for the second year in a row. For full race results from the exciting weekend, click here. Women's Varsity 8 image selected as winner in World rowing's #internationalwomensday photo contest. This year's novice crew is starting their season off with some hardware! Women's Novice 4+ took the gold and the Novice 8+ took the bronze. After a crazy season, the Novice and Varsity teams proved themselves against the tough competition in Gainesville, GA over Memorial Day Weekend. The Novice 8+ clenched GOLD and the title of National Champions, two seconds ahead of second place team Colorado. The Varsity 4+ finished 6th in Grand Finals, and our first ever Varsity Pair (the infamous UC Davis Women's Pair) took 2nd in the B Final. Find all the weekend's results here. In honor of US Rowing's third annual Coxswain Appreciation Week on May 1st through May 7th, the team presented Lauren and Alice with personalized t-shirts signed by the Varsity and novice crews with messages of encouragement and appreciation. Big congratulations to Alice, who was recognized as runner-up in the #CoxieAppreciation social media campaign as a "Coxswain who keeps their cool"! Read about it here. The Varsity and Novice crews gave it their all against some tough competition at the 2016 Western Intercollegiate Rowing Championships at Sac State Aquatic Center on April 30th and May 1st. The Novice 4+ finished in 6th in their Grand Final following UC Irvine and ahead of Cal Lightweights. The Varsity 4+ finished 5th in their Grand Final following UC Irvine and ahead of UC Santa Barbara. Find the all the race results from the weekend here. In the annual tradition, athletes wore their red UC Davis shirts to practice every day of the week, inspiring aggression and unity against the common cause of beating the other teams at WIRA. The team came together for an intense week of practice leading up to the Western Intercollegiate Rowing Championships at Sac State Aquatic Center on April 30th through May 1st. The Varsity 8+ took fifth in Grand Finals just behind UC Irvine on Sunday, April 3rd. The Novice 8+ took 2nd place only to UC Santa Barbara after a less than typical rolling start due to windy conditions. After several years, we were fortunate to have a rock solid group of alumni join us this year to compete and represent UC Davis in the Women’s Alumni category. Sunday, May 24th, UC Davis's Women's Novice four claimed the silver with a time of 8:00.23 at the American Collegiate Rowing Association. Following the US Military Academy at West Point (7.48.20) and came in ahead of University of New Hampshire (8:02.73). 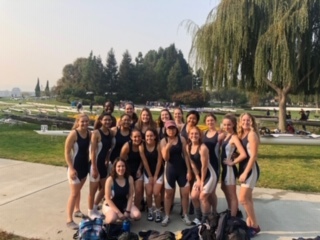 Sunday, April 26th, coming from behind in lane 6, UC Davis's Women's JV8+ stole the bronze with a time of 7:42.1 at the Western Intercollegiate Rowing Association Championships. Following UC San Diego (7.35.8) and came in ahead of Western Washington University (7:47.1).